• After a decline from 1990 to 2004, the percentage of U.S. births that occurred at home increased by 29%, from 0.56% of births in 2004 to 0.72% in 2009.
to 1.09% in 2009. About 1 in every 90 births for non- Hispanic white women is now a home birth. Home births are less common among women of other racial or ethnic groups. • Home births have a lower risk profile than hospital births, with fewer births to teenagers or unmarried women, and with fewer preterm, low birthweight, and multiple births. Louisiana and the District of Columbia, to a high of 2.0% in Oregon and 2.6% in Montana. But there’s one thing that the data brief didn’t mention at all: exactly how many of those babies died? The authors managed to analyze homebirths by race. They managed to analyze homebirth in each and every state. They managed to analyzed the risk profile of homebirths. But somehow they couldn’t manage to check the neonatal death rate for homebirth located on one of the CDC’s own websites. They are curiously silent on the most important thing we need to know about homebirth: is it safe? Had MacDorman et al. 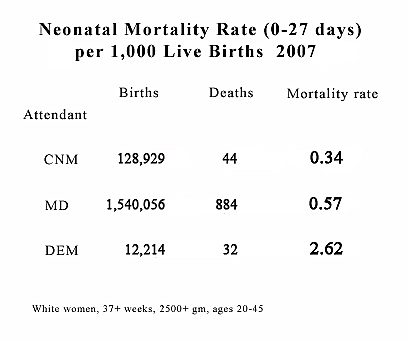 bothered to look, they would have seen that the most recent CDC data shows that homebirth with a non-nurse midwife has a neonatal mortality rate 7.7 times higher than comparable risk hospital birth! This extraordinarily high death rate is all the more remarkable because it actually under-counts the homebirth death rate. That’s because homebirth transfers ended up in the hospital MD group and were not counted in the homebirth group. The real number of homebirth deaths is almost certainly significantly higher. While MacDorman et al. were busily analyzing the state level data, they could have learned that in the state of Colorado, which has licensed homebirth midwives since 2006, the homebirth death rate has exceeded the death rate for the state as a whole (including premature babies and pregnancy complicati­ons) in every single year since and has risen in every single year since 2006, The death rates are so appalling that the homebirth midwives of Colorado refused to release the death rates for 2010. Or they could have learned that the state of Oregon has had at least 19 reported neonatal deaths in the past 10 years for a rate that is more than 4 times higher than the death rate for comparable risk hospital birth. Every major news outlet has reported on this CDC data brief, and curiously, not one bothered to ask how many of the homebirth babies died. A few news outlets made vague pronouncements that homebirth might double or triple the neonatal death rate, but not a single one bothered to find out what actually happened in the group that MacDorman and colleagues studied. I’ll admit that I’m pretty frustrated by the fact that MacDorman et al never bothered to look at the neonatal death rate, or looked at it and didn’t bother to report it. Who really cares that the homebirth rate rose an additional 9% since 2008? Yet somehow MacDorman thought it was critical to report on that. Everyone needs to know how many of those babies died, yet MacDorman couldn’t be bothered to report on that. And I’m also pretty frustrated by the mainstream media. There are no questions, no probing, and no investigation into the number of babies who died. It’s as if they don’t exist. Journalists just collected opposing viewpoints and wrote “balanced” articles that inexplicably left out the most important issue. And while journalists interviewed midwives and obstetricians, not a single one thought to interview a pediatrician or a neonatologist to determine whether the people who actually care for babies think about the dangers of homebirth to babies. I’m afraid that the only thing that will shake journalists out of their complacency is the death of a celebrity’s baby at homebirth. Sooner or later that is going to happen, and journalists will “discover” that babies have been dying preventable deaths at homebirth all along. Until then, they won’t ask the difficult questions; they’ll simply accept what they read in press releases and reprint them wholesale.